Just before 3am on January 24th, 1941, when Britain was preoccupied with surviving the Blitz, the body of Josslyn Hay, Earl of Erroll, was discovered lying on the floor of his Buick, at a road intersection some miles outside Nairobi, with a bullet in his head. A leading figure in Kenya's colonial community, he had recently been appointed Military Secretary, but he was primarily a seducer of other men's wives. Sir Henry Delves Broughton, whose wife was Erroll's current conquest, had an obvious motive for the murder, but no one was ever convicted and the question of who killed him became a classic mystery, a scandel and cause celebre. Among those who became fascinated with the Erroll case was Cyril Connolly. He joined up with James Fox for a major investigation of the case in 1969 for the SUNDAY TIMES magazine. 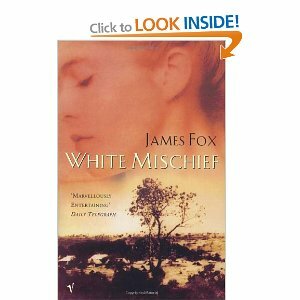 After his death James Fox inherited the obsession and a commitment to continue in pursuit of the story both in England and Kenya in the late 1970s. One day, on a veranda overlooking the Indian Ocean, Fox came across a piece of evidence that seemed to bring all the fragments and pieces together and convinced him that he saw a complete picture. As Fox retells the story of Broughton's trial, I actually began to grow quite tiresome of the case. I felt quite frustrated and angered at the 'characters' and was not sure if I would continue to read the book. Then there was a shift in style. Fox began to continue Connolly's search for key players in the case, such as Hugh Dickinson, the pace seemed to speed up and become a thrilling detective novel. I couldn't put down the book...and one night I had to sleep with my duvet over my head (true...am a scaedy cat!!). My own theory of 'who killed Erroll' changed by the chapter, but generally swung back and forth between Broughton and Diana, (then Caldwell, later Delamere...well, the Delamere family are known for being fine shooters...right!!??) until the end, when Fox reveals some important evidence. "He looked happier than I had ever seen him before. He even told me, "Wilkie, I'm much happier here than I ever was in Karen." Haaaaaaa! Love it! I could go on...but that is boring...just read the book yourself! Basically, this was the best read I have had for a while and would recommend it to anyone interested in colonial Africa or just anyone who likes a good detective story. I now am going to try and hunt down the film. Is the film any good? Looks like a fascinating read. I adore that era, even when the storyline isn't the most uplifting, there's something to be said about those who survived it. Sounds good, I love a good mystery. Thanks for the suggestion! I realise this post was VERY long! thanks for reading Branflake and Liene! I love a historical mystery! good timing for me! i have been looking for a good book to read, despite the stack of unread books beside me. THIS sounds like the book i've been looking for. i'm going on my first camping trip of the season in a few days- so i hope to have a copy with me when i leave. and wow- a bathtub in a canoe! i introduced myself to your blog and have it linked at mine now. you are a breath of fresh air! sherry-thank you-you are being too kind!hope you track it down for your camping trip!